Drought again? Or is something else going on in the slimming Colorado River? Peak runoff in the Colorado River this year has arrived exceptionally early and with unusual modesty. It’s part of a pattern in the 21st century, one that scientists warn will become even more common in the future. 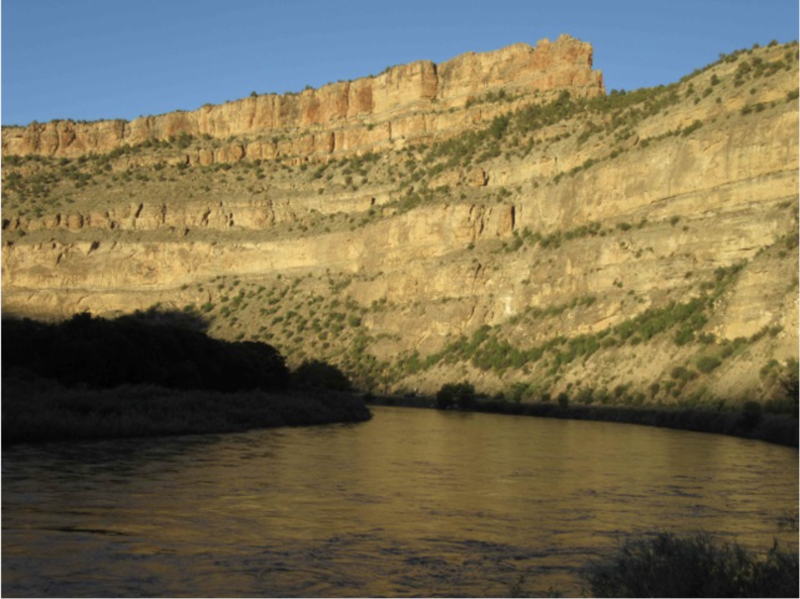 One measuring site is at Cameo, located amid sandstone cliffs coated with desert varnish two hours downstream from Aspen and Vail and a short distance from Grand Junction. There, runoff in the Colorado River reached 6,650 cubic feet per second on Monday. 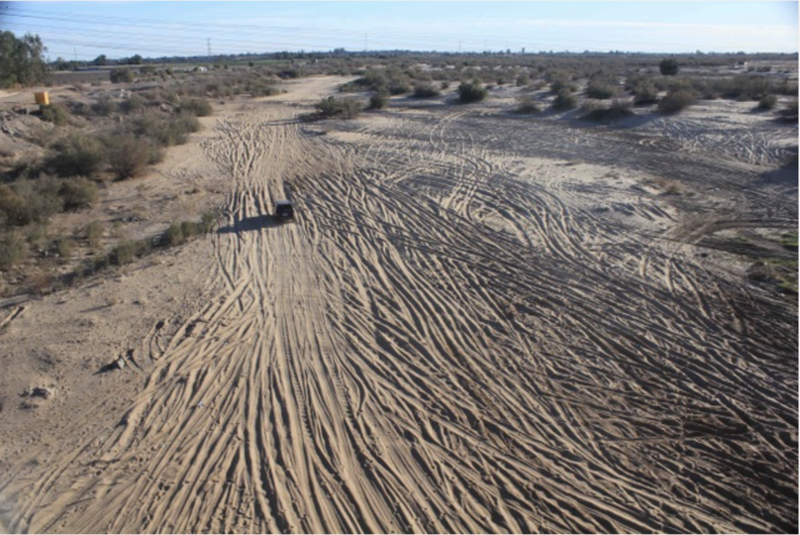 Unless surpassed by a second surge of runoff predicted for Saturday, it is likely to be the earliest date for peak runoff at the site in 50 years, according to the Colorado River Water Conservation District. It’s also a runoff of modest flows, the fourth lowest in 85 years of record-keeping at Cameo. 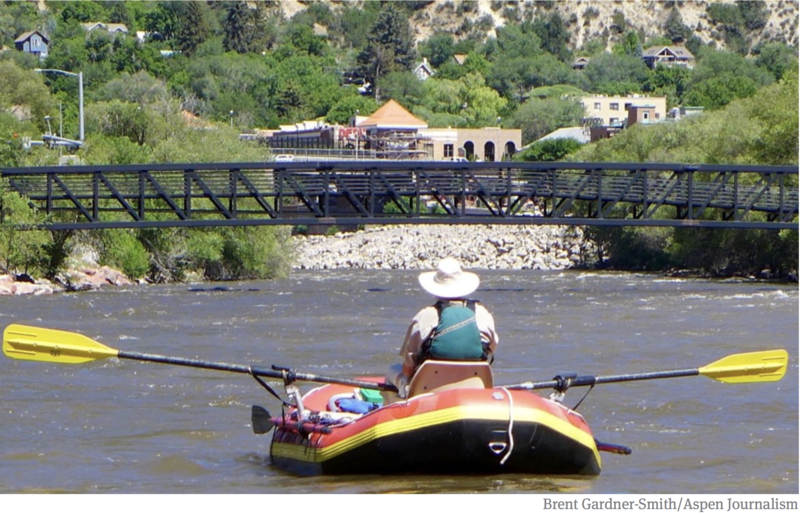 The lowest was in 1977, according to the Glenwood Springs-based River District, followed by those of 2002 and 2012—and now 2018. Winter was warmer and drier than usual, and the last month has been the same: 2 to 4 degrees Fahrenheit warmer than average. Spring precipitation has similarly lagged across western Colorado.Also contributing to this year’s runoff story have been six dust storms since late March, the most recent last weekend. The darker desert dust sprinkled on the high-mountain snows absorbs more sunlight, helping speed melting. Lukas, the lead author of a 2014 state-commissioned synthesis report called “Climate Change in Colorado,” also points to the clustering of unusually low runoffs in the last 16 years. It is “suspicious, let’s say, and may speak to the contribution of human-caused warming,” he observes. Taking the long view, Lukas notes there’s a lot of “noise” or natural variability in the climate records. But this clustering suggests a changed norm. What used to be the sort of runoff that might occur every 25 years could now, perhaps, be expected about every 10 years. Lukas has also studied growth rings of trees in the Colorado River Basin to document past environmental conditions as far back as 762 A.D. Those tree rings directly correspond to wetter and dryer, hotter and colder periods during the last 1,000 years. The trees also reveal droughts longer than any in the roughly 150 years of recorded history on the Colorado River. In 2007, a University of Arizona team reported finding evidence of 13 consecutive years of sub-average flows. It was part of a longer 60-year period of drought in the 11th and 12th centuries that archaeologists believe was at least a significant factor in why the ancestral Pueblo, also called the Anasazi, abandoned their cliff dwellings in Chaco Culture National Historic Park and Mesa Verde National Park. Even in 2007, scientists were saying that these mega-droughts of the past might be similar to the Southwest in a world warmed by greenhouse gas emissions. But the past is an imperfect guide to the future. “We need to consider that if these extended droughts occur, they will occur under warmer conditions than those of the past, so they won’t be analogous with respect to the impacts of temperature on drought, although the moisture deficits could be similar,” according to Connie Woodhouse, a co-author of that 2007 report. In 2017, two climate and water researchers issued a paper that concluded that the warming world is producing drought-like conditions. Jonathan Overpeck, one of the authors, was in Santa Fe recently, where he warned against thinking of it as a drought as conventionally understood. 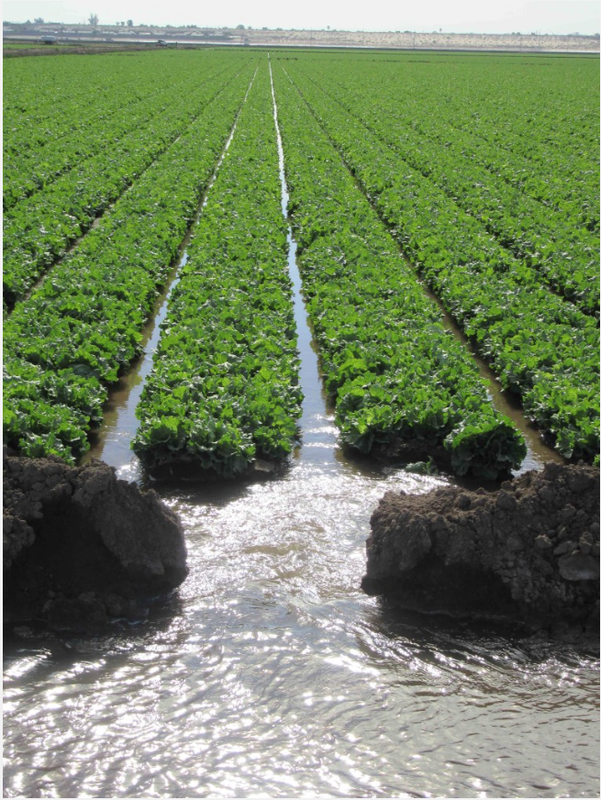 “Precipitation in this current drought is a contributor, a secondary contributor. The main cause of this drought is temperature,” he said at the Next Generation Water Summit. Showing a chart, he observed that the temperature line corresponds with declining flows. “This is the kind of drought we will have to deal with in the future,” he said. Temperatures in the region have increased, and as they do, the warming atmosphere needs more moisture. Overpeck and his co-researcher, Brad Udall of Colorado State University, concluded that the moisture is being induced into the atmosphere through increased evaporation and transpiration. “This turns out to be the very biggest consequence of the temperature-induced drought in the Colorado River Basin,” he said. “Wildfire is going crazy in the Southwest, and it’s for the same reason,” added Overpeck, who is now dean of the School for Environment and Sustainability at the University of Michigan. 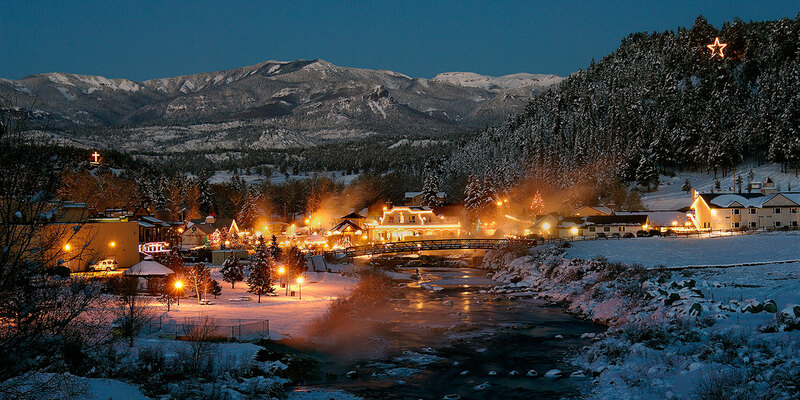 He was formerly at the University of Arizona and still has a cabin in the San Juan Mountains near Telluride. Can this be called a megadrought? He said he gets asked that often, and technically, no, it’s not. It’s only lasted 19 years, and the definition of megadrought that he and others agreed upon earlier in the century begins at 20 years. But, he added, this certainly looks a lot like the megadrought of 900 years ago discovered by dendrochronologists. The pails of water in the West went from full to the brim to half empty or less in a short time. Lake Mead and Lake Powell, the two giant reservoirs of the Colorado River Basin, were full in 1998, as were most of the smaller reservoirs at the headwaters near the ski towns. They’ve been mostly ebbing ever since. The U.S. Bureau of Reclamation on Monday reported that Lake Powell was at 52 percent of capacity and Lake Mead, near Las Vegas, was down to 39 percent of capacity. These shrinking reservoirs have caused some to call for what Edward Abbey mirthfully imagined in the “Monkeywrench Gang,” the dismantling Glen Canyon Dam and draining of Lake Powell. The argument is that this will reduce evaporation and more efficiently store the water that is likely in the warming Southwest. The idea has received little traction, but University of Utah professor Jack Schmidt said it’s worth thinking about. “It’s an idea that, no after how much you think you understand the details, the idea won’t go away,” he said at the River District’s annual seminar in Grand Junction last September. He said he’s undecided, as there’s not enough yet known to understand the implications. 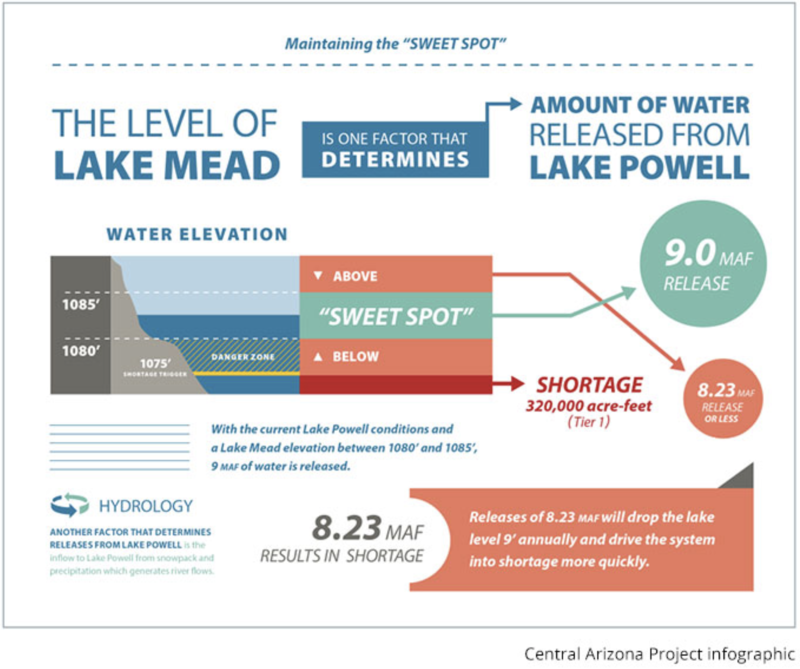 In April, a dispute about how much water is released from Lake Powell to flow downstream into Lake Mead flared among the seven basin states. Denver Water and representatives of Colorado, Wyoming, Utah and New Mexico dispatched letters to the Central Arizona Project accusing that water agency of manipulating water supplies and demands at the expense of teamwork and collaboration. The Central Arizona Project delivers Colorado River water to Phoenix, Tucson and a host of towns and farms along the way. “It’s one water user taking advantage of a situation for their own benefit, to the detriment of a river that supplies nearly 40 million people,” Jim Lochhead, manager of Denver Water, told the Associated Press. 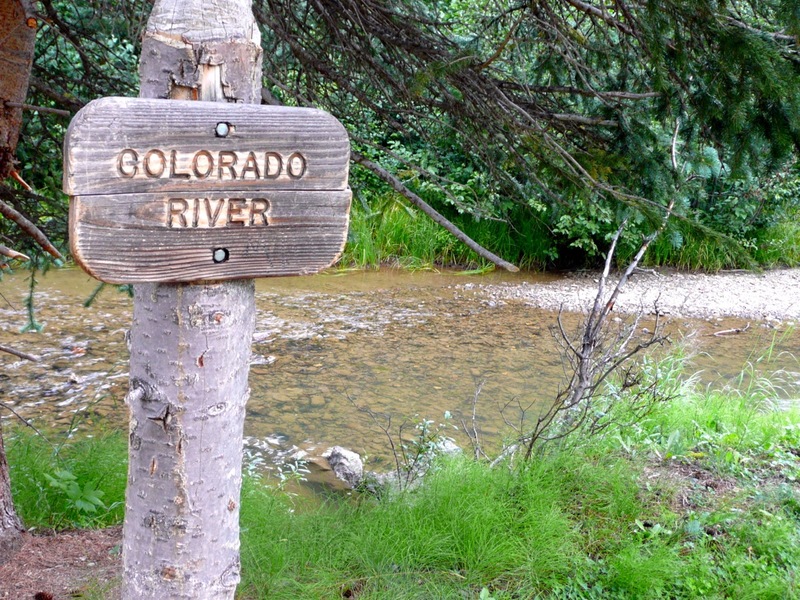 Denver Water gets about half its water from the Colorado River Basin and supplies about a quarter of all Colorado residents. Many other cities of the West not actually within the basin also get Colorado River water, including Cheyenne, Salt Lake City and Los Angeles, but even Santa Fe. Speaking in Santa Fe, Overpeck noted the sharp words among formerly collegial water users in the basin as a reflection of the rising tension about declining flows. 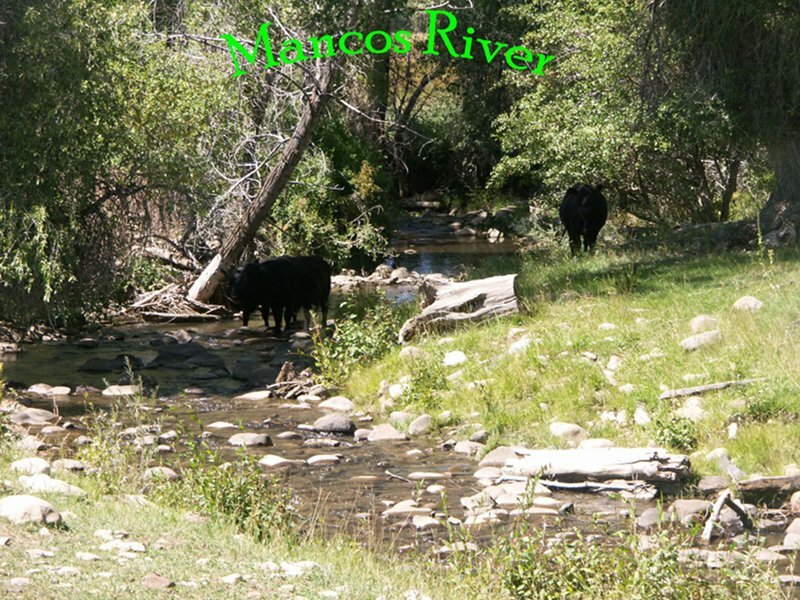 Flows in this 21st century temperature-induced drought are down 19 percent, said Overpeck. Future flows will almost certainly decline even more, he said. Even if greenhouse gas emissions get contained as outlined in the Paris climate accord, another 1 to 1.5 degrees C (1.8 to 2.7 degrees F) of temperature increase can be expected by 2100. If burning of fossil fuels continues unconstrained, temperatures might increase 5 to 7 degrees C (9 to 12.6 C). Might a warmer atmosphere also produce more precipitation? Don’t bet on it, he said. Even if it does, as some colleagues have persuaded him is possible, he remains sure that warmer temperatures will cause that precipitation to vanish. Why is he so sure? He points to the climate and hydroclimate modeling that, he said, have produced results consistent with experimental evidence and ongoing observations. In other words, the models seem to work. As Lukas said, it looks suspiciously like this sort of drought year won’t be all that uncommon in the future. 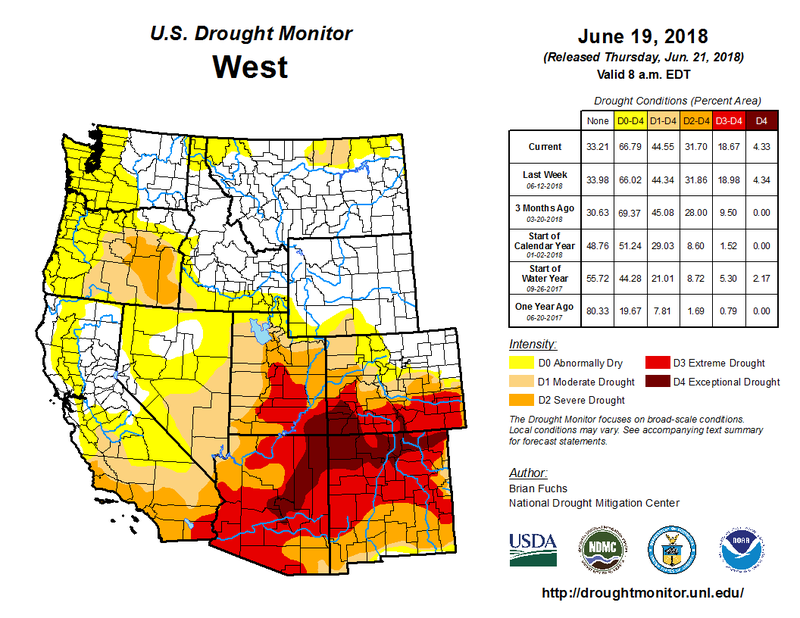 Because of an extremely low snowpack this winter and a hot, dry summer, the runoff forecast is at 15 percent of the historical 30-year average of 295,000 acre-feet for April through July. Precipitation for the 2018 water year at McPhee Reservoir, as measured at the Great Cut Dike, is the lowest recorded in the last 35 years. On June 14, Town Administrator Heather Alvarez announced that the town would be restricting residents’ outdoor water use. Residents will only be able to water on certain days, depending on their addresses, and only for four hours in the morning and evening. 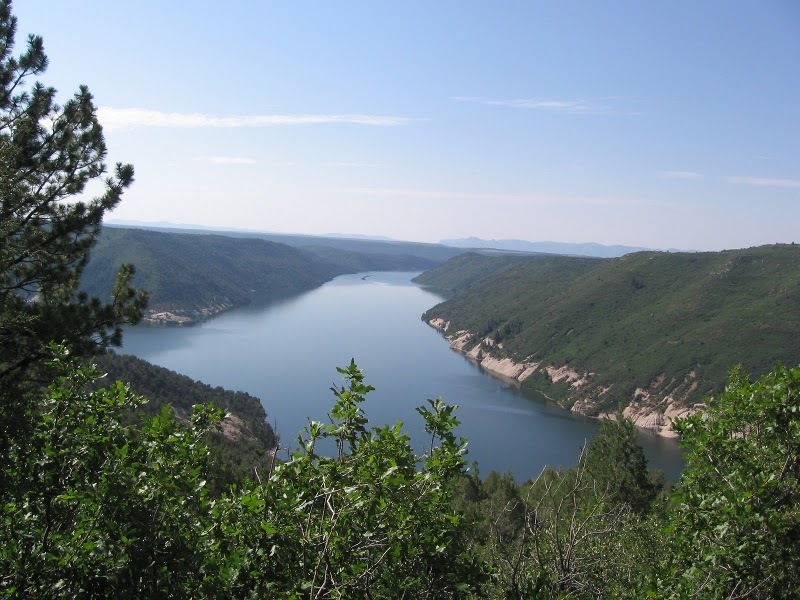 The town is not facing a water shortage right now, Alvarez said, but town staff want to be prepared for one if their water rights are temporarily called by the Colorado Division of Water Resources. 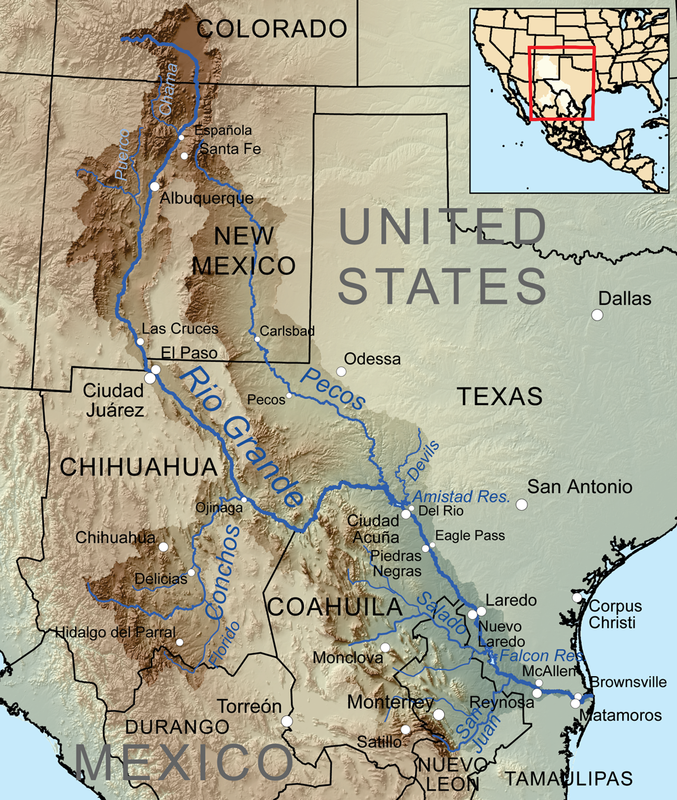 Map of the Rio Grande watershed, showing the Rio Chama joining the Rio Grande near Santa Fe. Graphic credit WikiMedia. Denver Water employees share their tips and tricks for drinking LOTS of water.